Pay once – download the offline software – no membership – no costs per year! Who can use easy Sports-Graphics? 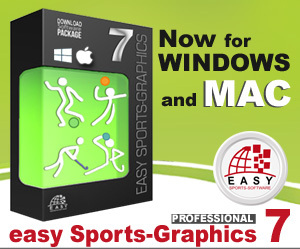 Easy Sports-Graphics provides a software solution for Coaches, Coaching directors, Clubs, Authors and Organizations. Create your own professional and visually rich diagrams to illustrate your coaching sessions. You can use the same tool that is used by Bundesliga clubs, DFB/US Soccer/NSCAA and other Federations and European academies and coaches from grassroots to professional clubs. Download and install ESG 7 pro (MAC/Windows) onto your computer after payment in less than 5 minutes. Who is using easy Sports-Graphics? Presentation illustrated with easy Sports-Graphics at the big International Coaches Convention 2016 in Germany. Many presenters (DFB Coaches, Polish Soccer Federation, … ) at conventions and seminars are using easy Sport-Graphics 7 pro to design graphics for their PowerPoint presentations.